It's no secret that there is no shortage of dolls out there. Small, large, baby, adult, realistic, out-of-this-world... it seems as though no matter what style you're looking for, it's probably available. But what is it about certain dolls that have the ability to become favorites? The ones that end up more than just another discarded plaything, but give children the ability to make a connection? Those are the special few that are treasured and become more to the child than just a doll, they end up a true friend. So, is it possible to find one company that not only carries high quality, well made dolls for girls as well as boys, but is also on a mission to promote important concepts such as learning, caring and social consciousness? There is. Those are the unique and admirable My Sibling and My Pals Dolls from LorettaRose, LLC. A family-owned company that prides itself on producing high quality dolls and plush toys, LorettaRose, LLC has a fantastic Work Experience Program that gives teens and adults with developmental disabilities important work experiences, training and jobs in the packaging and labeling of available products. When it comes to the dolls themselves, I love the idea that My Sibling and My Pal Dolls look like traditional 18" dolls but have the added uniqueness of their socially relevant purpose, cause or difference that they each promote... not to mention that there are just as many great boy options as there are girls! Our society spends so much time trying to break down gender stereotypes and encourage all children to follow all of their interests, so why does it seem like the only male dolls that are available are all action figures or warriors? In stark contrast, My Sibling and My Pal Dolls are positive, well-made and easy to appreciate by children as well as adults. Is there a way that a soccer-loving boy or girl could be anything other than enthralled with My Pal for Soccer? Featuring black hair, brown eyes and medium skin, My Pal for Soccer was inspired by the creator's son and is the perfect buddy for children who have a strong interest in soccer. 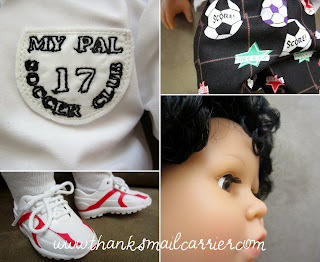 As my daughters have no shortage of girl dolls, it was a welcome change when the My Pal for Soccer boy doll arrived to change things up a bit. Standing 18" tall with a soft body and a posable plastic head, arms and legs, it didn't take long before we were admiring our little soccer player from head to toe. His shiny, rooted hair, his individual eyelashes, his pint-size soccer uniform... it's all just so cute while being so well-made! Both of the girls immediately pointed out that this new friend has soccer-themed shorts, an embroidered Velcro-closure shirt, white knee high socks, and (their favorite) white and red tennis shoes that tie and untie like real sneakers. All he needs now is a soccer ball and a goal, right? Well, considering that he comes with a soft miniature soccer ball, all we needed was to designate a goal and the game was on! 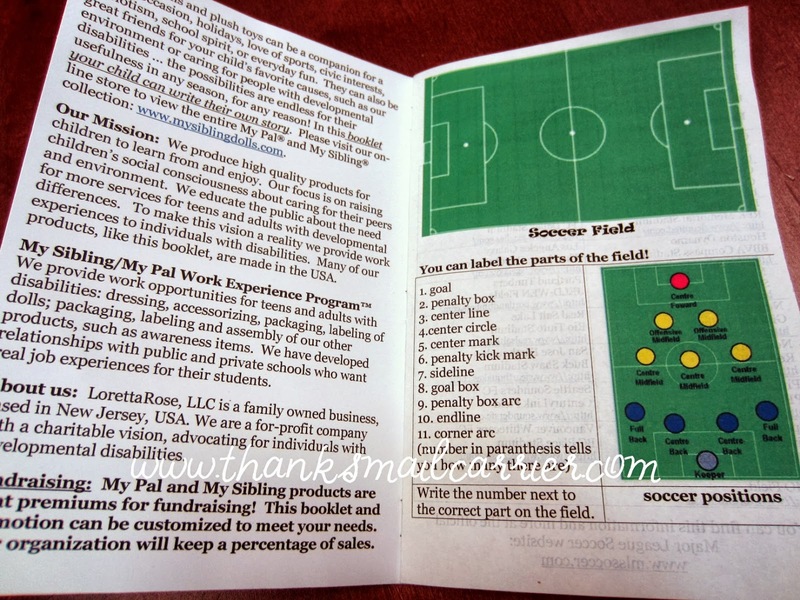 Along with the enjoyment of having a friend, each My Pal doll comes with a booklet for children to learn from and enjoy, and the one accompanying My Pal for Soccer is just right for the young fan. Children can learn about the parts of the soccer field, the positions of the soccer players and facts about Major League and International soccer teams. There are also pages on which children can write about their experiences playing or watching soccer, and their love for the sport. While I appreciate the uniqueness of My Pal for Soccer, I also love that he is durable enough that my daughters can play with him, while still having the look of a doll that might stay on the shelf. His hair is easy to brush and style and his cute, removable outfit is made in the USA. Gooooooooooal! And, when you're ready to shop, it's easy to take advantage of savings on these great dolls, as the varying sales are always just in time for the next holiday. For instance, My Pal for Giving Thanks will be on sale from October 28-November 2, while My Pal for Christmas and My Pal for Hannukah will be on sale from November 4-9 and November 18-23. Then just become a fan on Facebook to find out about great deals all year round! 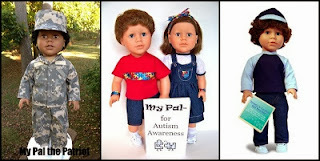 Be sure to visit MySiblingDolls.com to find out about the wide variety of My Pal and My Sibling Dolls available and connect with them on Facebook and Twitter to help spread the word about their great products and wonderful program. I like the 18" girl doll - My Sibling Victoria! I love the 18" girl doll - My sibling victoria. She looks like my granddaughter. My favorite is the My Pal for Tennis - brown hair blue eyes - white outfit. 18" boy doll - My Pal® for My School would be perfect for my son! I love the 18" girl doll - My Sibling® - Mae. I love the 18" boy doll - My Sibling® - Matty. And I also really like the x- shorts outfit - plaid #1 with red t shirt. My daughter would love the girl soccer pal since she plays soccer too. The 18" Boy Doll, My Pal For Christmas is my favorite. My pal for peace would be my choice. I like the my pal for soccer doll. I like the blonde girl- my pal for going green. She's soooo pretty! What a great way to support a cause! I like the My Sibling Doll April. I like the My Sibling Victoria doll. I really like the my pal for peace Girl doll. I have a couple little girl who would love these dolls. They are very nice. im not sure which is my fave i like the boy my pals for the sports! I like the 18" doll My Pal for Christmas! I like the 18" girl doll - My Pal® for Christmas. I would choose My Sibling-Tommy for my granddaughter. She has 2 brothers though so I don't know how well that would go over. I like the 18" boy doll - My Pal® for Christmas. My favorite item is the Andy doll, he's super cute! I like the My pal for baby blue elephant. The 18" girl doll for autism is nice as well. 18" girl doll - My Pal for Going Green! I like the autism awareness boy pal. I like 18" boy doll - My Pal® the Patriot - Navy. He would be prefect! I love the 18" Boy Doll My Pal for Baseball. I like My Pal the Patriot. I like my sibling Victoria. The plush toy ***My Pal® for BABY*** pink elephant is adorable! I like the 18" boy doll - My Pal for Baseball. I can't decide...probably the soccer girl since my nieces play soccer. I like the My Pal girl doll for Christmas. I like the Girl Pal for school because my granddaughter just started kindergarten and was nervous about it. The 18" Boy Doll, My Pal For Christmas is my favorite. Thanks so much for the fantastic giveaway! I like my pal Andy. He's a cutie! I like the Autism Awareness doll. It would be perfect for a little boy that I know with Autism. These are so cute thank you for the review - I especially like this one 18" boy doll - My Pal® for Going Green! My sibling Andy - 18" doll. 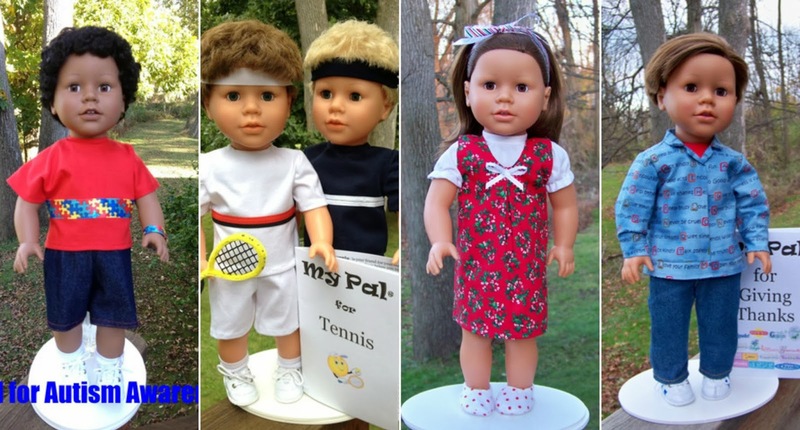 I like the 18" girl doll - My Pal® for Tennis or the My Pal® for Peace. Love the Girl My Pal for Peace doll! My Pal® the Patriot - Navy, my husband is in the Navy and I think that one is cool! I love the 18" girl doll - My Pal for Peace! My favorite is the 18" girl doll- My pal for Peace. 18" girl doll - My Pal® for Christmas is my favorite. I like the 18" girl doll - My Pal® for Peace. Thanks. I like the 18" girl doll - My Sibling® - Victoria. I like the boy - My pal for giving thanks. Very fun! I love the plush toy ***My Pal® for BABY*** pink elephant. My daughter would like one of the my siblings girl dolls. 18" boy doll - My Pal® the Patriot - Navy. I like the boy doll for going green. I like the boy 18 inch tennis doll. My favorite is the 18" girl doll - My Sibling® - Mae. My pal for peace is my favorite. I like the 18" girl doll - My Sibling® - Mae. I like My Pal Soccer girl doll. the 18" girl doll - My Sibling® - Mae. I like the Sibling doll Mae. MY PAL FOR PEACE...SHE'S SOOO CUTE - MY DAUGHTER WOULD LOVE HER!! The 18" doll My Pal is my favorite. I like any of the boy dolls. They'd be great for my little guy. My daughter would love the mae doll! I like the my sibling dolls. Any of the boy ones would be perfect! I love the 18" girl doll - My Sibling® - Mae. She looks SO much like my niece, Ashlyn, it's crazy! The 18" boy doll - My Pal® the Patriot is my favorite. I would love to have the My Pal for Giving Thanks boy for my own little boy! I would love to have the 18" boy doll-My Pal the Patriot Doll in Navy for my son. I like 18" girl doll - My Sibling® - Victoria. My favorite is the 18 inch boy doll My Pal the Patriot. My son would love this. I like the 18" boy doll - My Pal® the Patriot - Navy. My daughter would like the Mae doll. Thanks for the chance. 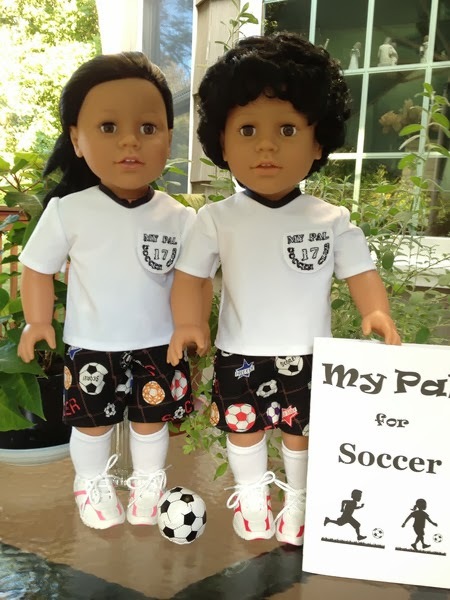 My daughter would like the 18" girl doll - My Pal® for Soccer because she just started playing soccer so I know she would want her. I LIKE THE AUTISM AWARENESS DOLLS!! All their products are so cute, but I think my favorite is the 18" girl doll - My Sibling® - Mae! My favorite product is the 18"girl doll- My Pal For peace. 18" girl doll - My Pal® for Going Green! I think the 18" boy doll - My Pal® for Peace is really cute! 18" Girl Doll My Pal for Soccer! I lie My Sibling Mae. love the 18 inch boy doll - My Pal the Patriot. I like the My Pal for Christmas doll. My favorite is the 18" girl doll - My Pal® for Peace. Thank you for the wonderful giveaway! I like the 18 inch boy doll - My Pal for Giving Thanks. I would get my sibling Mae for my daughter. my favorite is the Mae 18 inch doll! Thanks so much for the chance to win something great!